On our first trip to Israel we encountered this goat ... the first smile received in Israel!!! How happy we were to find our friend still there, especially since we learned on our previous trip what he was all about. 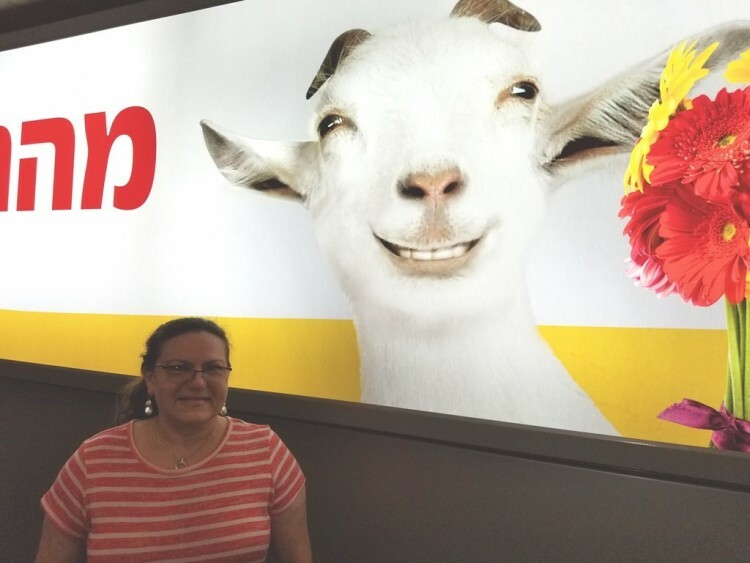 When you get off the plane at Ben Gurion airport in Tel Aviv, Israel, before you encounter any other Israeli official, you will be greeting by the big, smiling face of a goat. Not just ANY goat... no, no ... this is the YELLOW goat. Yellow is a popular chain of gas stations with food store attached (like WAWA or Sheetz in eastern U.S.) Many delicious food items and great prices on gas! Right now Yellow is having a special promotion where if you buy a little cup of ice cream, they will pour a special dark coffee over the top ... YUM!